The Crawford Fund’s WA State Committee is proud to have sponsored two scholars to attend the 2016 annual conference on ‘Waste Not, Want Not: The Circular Economy to Food Security’. In addition, the Australian Export Grains Innovation Centre (AEGIC) supported an additional scholar to attend the conference this year. This was the first time I had the opportunity to meet people from a diverse research background in one conference. It was exciting to discover what they have achieved in agriculture research, how they established their career in their own field of expertise and later expanded their research interest to other relevant fields. There were some fantastic speakers at the conference, such as Professor Louise Fresco. I felt very humbled that the conference organizers gave us the opportunity to listen to her speech in both the conference and scholars’ programs. Her power of thinking is a true guidance to young people about career, self-development and choice of living. Her view of agriculture enlightened me to have a neutral understanding of issues on food waste in different parts of the world. I was particularly enlightened to meet and listen to the speakers’ views from both developed and developing countries. People with different cultures and lifestyles usually have different aspects or expectations on the same issue. This conference was a perfect occasion to observe such differences. Being immersed in a multicultural environment for years, I have become more aware and have a more acute sense of observation. The talks at the conference made me more confident to be objective on issues relating to international agriculture development. The mentor-mentee section was in particular very inspirational and helpful. All the mentors are passionate about their international agricultural research projects and willing to offer help in the developing world. It was a very unique experience to have a matched mentor in the conference and I was delighted to have Professor Peter Wynn as my mentor who is amiable to chat with and have critical discussions. Being one of the scholars, I feel the major benefit of this conference was networking and seeking potential job opportunities. The set-up of the conference gave us the maximum time to speak with experts and ask questions. Their experience ranged from being a volunteer, trainer and graduate to a postgraduate and scientist. These experiences are valuable for me to have a clearer idea of the possibilities lying in the international agriculture area. It was always a joy to meet people and be encouraged by them. Unlike most of the scholars who are about to complete their degree and start to look for jobs, my main interest in this conference was to see how I can further develop my career in agriculture development. I am keen to develop my career along a pathway where I can fully utilize my cultural background and my field of expertise. I was happy to meet people that have been pursuing a similar pathway with their passion in science and love of culture. Overall, it was a valuable experience as an early career scientist to be part of this conference. I really appreciated the WA Crawford committee granting me this opportunity to attend this event. I cannot thank the Crawford Fund enough for the opportunity to attend such a wonderful and informative conference. The broad topic and diversity of speakers ensured that this conference offered value to every attendant. As a university student with a background in law and economics, I was doubtful as to the relevance of all the topics covered, having such an agricultural and scientific focus. However, I couldn’t have been more wrong. The conference began for me with the flight from Perth where I was privileged to meet the other two Perth scholars that were also attending the conference. It was incredible to meet two people who were so passionate about the industries they were in and I thoroughly enjoyed talking to them. This set the scene for the rest of the conference. The next day I attended the first of the scholar days which were informal settings where we, as scholars, had the opportunity to listen to a variety of speakers, along with ample opportunities to network with many of the mentors and speakers. It was at this event that I met my mentor, Miriam McCormack. I gained so much from being paired with Miriam as she only recently finished her studies and as a current student myself I found I could relate to her and her experiences more. Furthermore, Miriam was able to introduce me to many of her colleagues at both the Australia Centre for International Agricultural Research (ACIAR) and Researchers in Agriculture for International Development (RAID). Having these assigned mentors was a very valuable addition as they acted as a point of contact and all of the mentors I spoke to had embraced their role and were beyond willing to assist the scholars in any way they could. Following this first scholar day, I attended the Sir John Crawford memorial Address and Networking Dinner. This dinner was a good taste of what to expect from the conference the following day with many more people in attendance than what had been at the scholar day. At the same time, this provided more of an opportunity to meet with and network with other scholar attendees. The networking skills which I have gained from this conference are sure to prove invaluable for the rest of my professional development. Although I thoroughly enjoyed the scholar day, I had grown a little concerned at the narrower agriculture focus than what I had expected. However, any concerns I had about this quickly disappeared when listening to the memorial address titled ‘The Future of our Food’ delivered by Professor Louise Fresco. Within this address she continuously spoke about the links between agriculture, science, economics, business and policy in addressing the increasingly prominent problem of food security. This broad relevance of the speaker’s topics continued into the conference the following day, and as a result I cannot stress enough how much I gained from this day. More specifically, the first keynote speaker, Dr Karen Brooks’ talk particularly resonated with me. This is predominantly due to her background in economics and policy, similar to my own studies. Furthermore, I particularly found her discussion on negative externalities, such as the production of greenhouse gases from food waste, highly relevant. I also enjoyed the way she brought such a huge issue down to much more of a personal and relatable level. Other speakers which I enjoyed and benefitted from include Professor Ashok Gulati and his discussion about the benefits of having a demand driven system; and Mr Simon Costa and his discussion of food waste being a fundamental investment error. During this day I also had plenty of opportunities to network with many of the speakers and other conference attendees which I found to be incredibly valuable. Finally, the conference ended with a bittersweet final scholar day following the main conference event. This was another opportunity to listen to amazing speakers and express how each of us benefited from this event. I cannot thank the Crawford fund enough for this wonderful opportunity to attend the conference. The amazing people I met and had the pleasure to listen to have inspired me in what is such an important topic of global food scarcity. Furthermore, the networking skills I have gained at this event will prove incredibly valuable to me for the rest of my life. Well, what can you say? 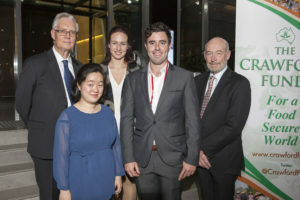 The Crawford Fund’s annual conference in Canberra was certainly a life changing experience and one that has certainly opened my eyes to the challenges of food security and sustainability in our ever changing world. One of the many highlights of the three day conference was getting to know similar agricultural enthusiasts from around Australia who are all doing wonderful jobs in the various fields within Agriculture. Yes we were all different, however, we all shared the common goal of making the world a better place for the future through our dedication to improve agriculture in our chosen field. Each and every scholar was very down to earth and easy to get along with, creating an environment whereby communication was open and transparent so much was learnt over the three days just by short conversations with each other. These relationships will be ones I will value for life and especially as I start my career in agriculture. Another highlight was the Sir John memorial speech from Dr Louise Fresco who blew me away with her passion to improve science and technology and her extensive experience with dealing with food security and sustainability issues all over the world. She encouraged us to “tell a story” which really hit home to me and has since encouraged myself to write my own story and to make a difference, however big or small. She was such an engaging and interesting lady and I know it inspired each and every one of us scholars to do great things in agriculture. The conference itself was eye opening to say the least and made me realise just how many people are doing great things in agriculture across the globe. I come from an economic background myself and it was refreshing to hear from some of the top scientists and researchers around the world and how they are impacting people’s lives on the ground in developing countries. The fact that we waste or lose 1/3 of the total food we produce is just astounding and has really driven me to change consumer behaviour in developed countries like Australia. Having the opportunity to be assigned a mentor for the three days was a great initiative by the Crawford Fund as it gave each scholar a chance to engage on a deep and personal level with a person who has invaluable experience within the industry. Personally, I was extremely lucky to be assigned to Terry Enright who was just fantastic. Terry had been a farmer himself and is now the chair of AEGIC, amongst a host of other boards within Agriculture. He will be a person I will be able to gain advice and support from for a long time whilst I start my career. Along with our mentors, RAID did a great job of galvanising the group and sharing their many experiences in international research and the opportunities available to each and every one of us. It was certainly a conference I will never forget and has gone a long way to changing my entire perspective on food security across the world.